I think it’s pretty safe to say that most people who drive a Lamborghini enjoy, or at least don’t mind, getting attention. That’s something that goes double for anyone who specs theirs in “look-at-me” orange. That attention can come in many forms, including awe at the owner’s wealth, respect for his financial success, or simply appreciative stares from fellow driving enthusiasts as the high-spec machine drives by. 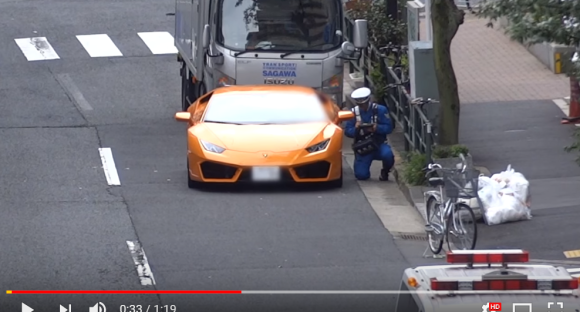 But the owner of the Lamborghini Huracán shown in this video filmed in Japan probably wished his car had been less eye-catching after a police officer spotted him making an illegal turn and caught his Italian exotic after a pursuit in a much more humble vehicle. As the video opens, the Huracán pulls up to an intersection, with the signal light letting traffic through if they are going straight ahead, but instructing cars that are turning left to wait. However, the driver of the Lamborghini either doesn’t notice the signal, or simply doesn’t care. He continues past the limit line, waits for a break in the stream of pedestrians walking across the crosswalk, and completes his turn, gassing the car enough that it’s exhaust growls as he accelerates away. …the pursuing police officer is on a bicycle! But with the power of gravity helping the officer pick up speed as he zips down the sloping sidewalk, he quickly catches up to the offending Huracán and orders it to pull over. The driver does, and the officer proceeds to write his ticket. In the driver’s defense, the illegal turn may have been an honest mistake, as he’s considerate enough of others to have used his turn signal during the incident. Nevertheless, the law is the law. And while the driver is no doubt unhappy about getting a ticket, he can at least take comfort in knowing that there have been Lamborghini owners in Japan who’ve had much worse days than this. Traffic will do that. Why even both buying a car? If you can afford to buy that car, especially in Japan, you can afford to wait a few extra seconds for the light to change. Not like you're worried about paying for GAS. I appreciate how the driver of the Sagawa truck parked behind the Lambo actually pushed his rear-view mirror away from the traffic. He is seen putting it back in its usual spot (driving). These clowns drive such cars down the Midosuji ever day in Osaka, speeding through traffic and playing like it’s fast and furious. I don’t see many skip through lights, but if the cops — like this guy — set up even ONE block anywhere in the street they’d nab dozens a day and make a mint. 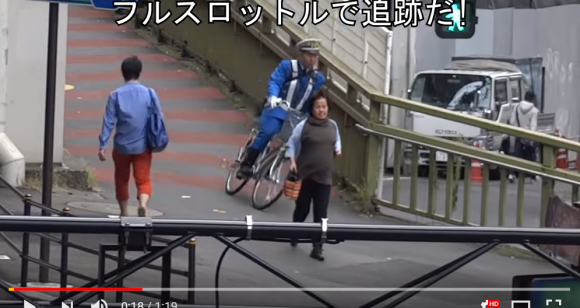 Good on this guy for not pulling he usual J-cop “shouga nai... maybe I’ll stop this old guy on his bike and check if it’s his!” Whole crimes are being committed right in front of him/her. I bet you any money that’s one of those confusing intersections where one thinks you can turn. The Lamborghini waits while pedestrians to cross and I bet they were unaware they could not. It’s pretty obvious from the immediate appearance of the cop from a concealed position behind that he was in wait for someone to make this mistake and is a favorite position to fill his fines quota. I bet if you go there you’ll find this cop or another doing the same thing. We have a stop sign not too far from us and a 100 meters away from a local Koban. At least once or twice a week they set up a sneaky trap to catch people who roll through and don’t fully stop. The road angle and the fact that it is a one way to your left means no traffic is coming from the left and you only have to concern yourself with what’s coming towards you on the right ,which is actually almost directly in front of you rather than an actual right turn which makes people roll through slowly as you can see what’s coming clearly long before the actual stop line. A stop sign is completely unnecessary and common sense dictates it should simply be a “give way” sign. But it’s too perfect a trap for the cops to apply common sense and too close to the station to give up. It really amounts to pretend police work instead of actual police work. Good on this guy for not pulling he usual J-cop “shouga nai... maybe I’ll stop this old guy on his bike and check if it’s his!” Whole crimes are being committed right in front of him/her. You started off good but you couldn't resists to add an accusation at the police. Can't you just for once say "well done" and leave it at that or does it hurt too much to pay a compliment to a country you acutely dislike without adding your own "facts"
I've overtaken several supercars on the highway in Japan in my van doing 100km/h or less. The last one was that electric BMW one, the i8 or whatever its called. I think it does 0-60mph in three seconds, but the guy was happily sitting there in the left lane doing 80km/h. A lot of Japanese car enthusiasts just like their cars. They don't see them as a p#&@$ extension or some carte blanche to drive like a maniac. You could buy a Porsche in Japan and never get the "midlife crisis, eh?" type jibes you get in the UK. Its just a car that you might think is kakkou ii. Ditto the comments about cops in Japan just catching people when it is convenient for them, not at actual blackspots. Hats off to this guy (cop). There is a bicycle race held in France every year its called "Tour de France" he so quick of the mark I reckon he could be a worthy contender! Take it from me. I have sold Ferrari for 15 years in this country. Not all Japanese buy a super cars either for the (look at me effect). It is because they belong to a car club and want a car that matches their status. Just like Rolls, Bentley, Maserati, Porsche, or a GTR Nismo Black addition. Pick your poison. Car clubs of every type are very popular in every Ken in Japan. If they are going to decide to punch it in an exotic car like a 488 Spider speciale, which by the way is the most popular foreign super car sold in Japan as of today. most of the time it will be at the track at some event. The ones racing up and down the streets in Osaka or any other city are just plain stupid and represent a small group of super car owners and I would bet they are very young and will lose that gold status off their drivers license very soon. I am not coming to the defense of the Lambo driver or because of my career or what I do for living. I just know the Japanese super car market very well. I worry less about a Japanese behind the wheel of a super car in Japan rather than some famous soccer or baseball player driving one here in Japan. I as well have to concur with the person that made the comment they have passed many of super car on the kosoku-Japanese highway in a normal JDM car. You have greater chance to get away with speeding in Prius then Ferrari California in red trust me. It’s pretty obvious from the immediate appearance of the cop from a concealed position behind that he was in wait for someone to make this mistake and is a favorite position to fill his fines quota. This is dead on. The above comment and I know as fact! Cops have quotas in Japan and said quota is coming at the end of the years when the quotas need to be met. More tickets issued the bigger the bonus! This is in Tokyo? A push bike is much faster than a car in crowded streets. On the flat, the Lamborghini could leave the bicycle in the dust in five seconds. But in a crowded street, a bicycle has the upper hand. I think the cop should be the one issued a ticket. Not only is he riding on the pavement, which in itself is illegal, he is going dangerously whereas in contrast the Lamborghini driver was driving with apparent care. I think the point made about quotas is probably correct. Wrong, if the pavement is 2M or wider in Tokyo it's fine. Seems you have an issue with the police doing their job? That is the old law, was changed to 3m or wider a few years back. He was in pursuit so maybe rules apply? That’s why it’s ludicrous to buy any kind of fast Car in Japan – – bicycles are often faster. It’s saved me a lot of money. It baffles me this made it to the news actually. Just a User: "You started off good but you couldn't resists to add an accusation at the police. Can't you just for once say "well done" and leave it at that or does it hurt too much to pay a compliment to a country you acutely dislike without adding your own "facts""
Sorry I don't meet your approval, friend -- it is always what I aspire to when I post, you know -- but the facts are the facts, whether you put them in quotation marks or not. And if you don't want to believe it and think I'm making things up, why is this an unusual story and not the norm -- a police officer pulling over someone violating traffic laws? It's not ONLY because he did it on his bike, it's because most police ignore these cars for a number of reasons and so the drivers are more reckless. This guy did good -- there is no question about that. It's newsworthy because it is an exception. toshiko: "@smith: I'd hate to write this to you but. from now on, spell Shi yo u ga nai. Shoga means ginger. You don't mean writing ginger. is empty." If you really want to get nit-picky about spelling and what not, you might want to try working on your punctuation and capitalization. I'm quite well aware that "shoga" means ginger, and I didn't write that since we're being technical -- I wrote "shouga". I don't like writing Japanese in Romaji at all because there are so many ways to do it; Nippon-shiki, Hebon-shiki, written accents over letters, adding "u"s because people think "Youko" is more proper for the extended vowel sound that "Yoko" (I agree, but that won't change the fact that the uninitiated will read it "YOU-ko" (with "you" being like the "you" in "You and I"), and try writing Osaka as "Oosaka" and see how it goes. Sorry, but I'm not writing out what some people feel are the exact, decided Roman character equivalents for a Japanese character; I'll stick with a more phonetic approach when dealing with Roma-ji Japanese. As the video opens, the Huracán pulls up to an intersection, with the signal light letting traffic through if its going straight ahead, but instructing cars that are turning left to wait. That cop looks really good looking! Coldly logical statement of facts.